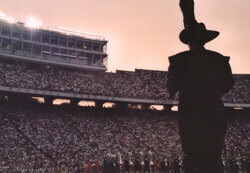 Madison, Wis. and Camp Randall Stadium is one of Drum Corps International's most venerable cities and venues. From the very first 1985 Madison-based World Championship to DCI's most recent stop in 2002, this year will be the seventh time drum corps descend upon Wisconsin's capital city. More than just a "college town," Madison is a cultural hub of the Midwest with many hidden gems in the surrounding area for even the most casual drum corps fans. Over the next month, Drum Corps World will run a series of articles on the Madison experience as fans gear up for the 2006 DCI World Championships starting on Aug. 8. Read "Part 1—Madison poised to welcome DCI back in grand fashion" on www.drumcorpsworld.com.